For Full Citizenship Rights! Defend Refugees by Opposing War! 24-06-2017 – Imagine living in limbo for four years, only to be told that you have four months to lodge an application for asylum, or face being deported. This is what faces thousands of refugees currently in Australia, following the latest move by Immigration Minister Peter Dutton. Liberal National Party (LNP) Minister Dutton has now given a deadline of October 1 to fill out a complex and involved application, for people who may be either illiterate, may not have English speaking ability, and may not be able to access any legal representation. This deadline refers to 30 500 people who arrived in Australia by boat between August 13, 2012, when the then Australian Labor Party (ALP) suspended processing of claims from “illegal maritime arrivals”, and January 1, 2014 – when those arriving were either turned back at sea or sent to offshore detention centres. These people have in some cases been waiting for four years to apply for asylum. Now they face somehow having to complete a 60 page application, full of dense legal definitions, comprising of over 100 questions. Kon Karapanagiotidis, of the Asylum Seeker Resource Centre, has stated that even experienced lawyers not trained in refugee law are not able to complete the applications. Experienced lawyers who are trained in refugee law can take up to eight hours to complete them. Hiring a private lawyer can cost $5000, a cost that is obviously unaffordable for asylum seekers trying to survive on welfare payments. Mr Karapanagiotidis claims that the government is trying to scare asylum seekers into completing the forms without any legal assistance, as the government is well aware that bodies that assist refugees and asylum seekers do not have the resources to even attempt this task. These measures contain a level of racism barely able to be conceived, but official government racism against those predominantly originating from less developed countries, does not stop there. The Federal Liberal government has proposed absurd levels of testing about so-called “Australian Values” for those applying for citizenship here. Instead of a one year waiting period, they are pushing for four years. Those applying will likely undergo strict English language tests, to a level which many Australian born residents would probably fail. On social media, some mocked and ridiculed Prime Minister Malcolm Turnbull, suggesting “Australian values” includes: telling others where speed cameras are, destroying 200 indigenous languages and then imposing your own, English being the 5th or 6th language of some indigenous people, and scoffing a kebab while complaining about Muslim immigrants. Some of the proposed questions are deliberately targeted to inflame anti-Islam hysteria, as if there wasn’t already enough. For example, questions such as: do you support female genital mutilation? And: Under what circumstances is it permissible for someone to strike their spouse within the confines of their own home? – are clearly hostile provocations against those whose religious beliefs may be Islamic. For centuries, people holding the Islamic religion have co-existed amongst Australian settlers, and amongst Australia’s indigenous people. All this changed after the misnamed “war on terror” began in the aftermath of the September 11 attacks on the World Trade Centre in New York in 2001. The Islamic – real or not – entity was the new bogeyman which the West conjured to replace the decades of Cold War anti-communism. Today, the atrocious wars of regime change in the Middle East by the Western powers and their allies, has once again incited extreme Islamophobia, even while the Western powers themselves arm, fund and train the terrorists they claim to be fighting. While the politicians cynically try to create an “Australian” us and a threatening “them”, basic civil liberties and democratic rights for those already citizens are being incinerated in the “fight against terrorism” – in a security scare which inevitably sweeps up refugees and asylum seekers. No matter how many times these same politicians and other liberals decry “totalitarian” Russia or China, totalitarianism here in Australia is reaching unprecedented levels. The right to free speech, the right to assembly, the right to form political organisations, the right not to be arbitrarily detained, the right to private communication – all of these and more are being ripped up before our very eyes. Edward Snowden and Julian Assange have risked their lives to inform us of the extent to which we can be monitored by “our own” spy agencies. For example, the National Security Legislation Amendment Bill (No.1) 2014, allows the Australian Secret Intelligence Service (ASIS) to collect intelligence on Australian citizens, to enable ASIS to cooperate with the ASIO without ministerial authorisation, and allows ASIO to cooperate with the private sector. Even data stored on your own personal computer is effectively no longer yours. Laws have been enacted which redefines a “computer” as a network, or one or more systems, or one or more computers. The entire internet connections of everyone in the country could be described as a “network”. And police would then only require one warrant to potentially hack into, or seize, any computer anywhere in the country. All in the name of security against “terrorism”. Almost anything can, and has, been justified by raising the word “terrorism”. This ties into the question of refugee and asylum seeker rights, because it is often directly raised in terms of a refugee being a potential “terrorist”. The Australian government has some hide accusing refugees and others of being potential “terrorists”. From practical experience over the last six years, it is this gang which has demonstrated not only that it does not “fight” terrorism, but in practice aids, assists, and works alongside actual terrorists. The Australian government politically backed NATO in its destruction of Libya, in which terrorists armed by the US and the UK were proxies using violence to bring down the former Libyan government headed by Colonel Gaddafi. In Syria, the Australian government has sent fighter jets and troops to materially aid the US, the UK, France, Saudi Arabia and Israel in their desperate attempt at regime change. To do so, the Australian military forces, working under US tutelage, cleared the way for the genocidal ISIS and Al Qaeda terrorists to slaughter untold numbers of innocents. These appalling wars caused thousands to flee as refugees, to Europe, Asia and Australia. This is one reason why working people should not accord this Australian state the right to decide who, and who is not, a citizen. We need to fight for full citizenship rights for all those who have made it to these shores. That is, the right to safe haven, as well as the right to work, medical and welfare benefits, housing, and the right to apply for citizenship if that is what is desired. The atrocious detention of innocent refugees and asylum seekers is linked to the abominable wars for Empire in which the Australian state is enmeshed. This is one reason why the refugee rights movement here must fully break from the domestic and foreign policy of Canberra. Thus far, however, in the main the refugee rights movement has sought a break with the domestic policies of the federal government, but has not attempted to break with the foreign policy of the national politicians, despite their claims. 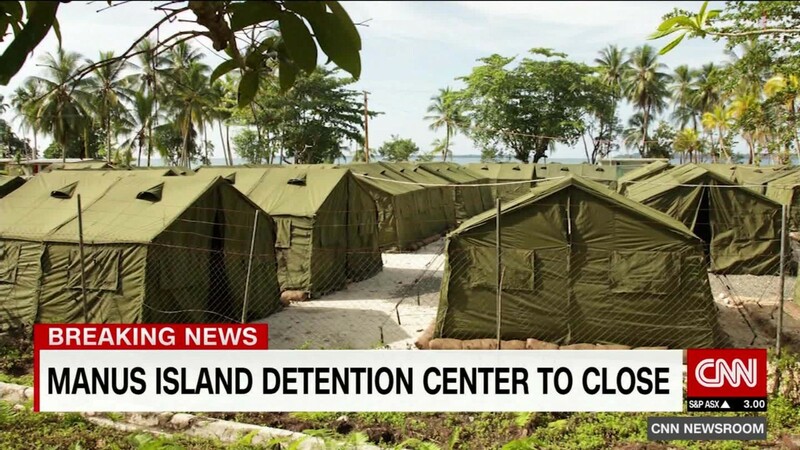 Hence, while groups such as the Refugee Action Collective (RAC), and the left parties which underpin it (such as Solidarity, Socialist Alternative and Socialist Alliance) correctly make efforts to force the government to close the Manus Island and Nauru detention centres, at the same time they endorse, or at least fall silent, when the Australian state wages refugee-creating wars in the Middle East and North Africa. Nor do they speak out when the US Empire, currently in the persona of Donald Trump, threatens to blow the Democratic People’s Republic of Korea (DPRK, or “North Korea”) off the face of the planet, threatening the world with nuclear war – and making potentially millions of refugees. RAC and their constituent left parties put forward the demand “Sack Peter Dutton”. No doubt the current Immigration Minister displays virulently anti-human capacities. However, the entire ruling and political establishment are a part of the same system. This demand, essentially a demand for the ruling class to shuffle around their personnel, also ties the refugee rights movement ever closer to the Australian state. The persecution of refugees is ultimately aimed at dividing workers against themselves, let alone it being draconian and unjust. It is thus in the interests of working people to strongly oppose these practices. However, by guiding the refugee rights movement politically towards the very politicians who enable this barbarism, RAC and some left parties turn those most abhorred by these practices back into the arms of those we should be campaigning against. In short, the politics becomes dependent on the political arms of the profit system. What is needed for refugee rights, and also for defending basic living and working conditions, is independent working class politics. This is the polar opposite of the “broad front” politics practiced by RAC and the left parties which drive it. They seek the broadest possible of fronts on the issue of refugee rights – which pushes them into forming alliances with the very forces which produce refugees in the first place. Even though the Australian Greens, for example, speak out against the abuse of refugees from the parliamentary benches, they are not about to do anything to jeopardise these cushioned seats. Rarely, there are some Australian Labor Party (ALP) politicians prepared to (timidly) oppose the detention of asylum seekers – but these are sought after as “broad” allies. NGOs such as GetUp! wage online campaigns for refugees, but their campaigns invariably target only Liberal ministers, giving the game away as to who they really work for. And while many church groups genuinely contribute valuable work towards refugee rights campaigns, in the end the limitations of their politics becomes one more conservative bloc which limits the “broad front” from taking the action which is most needed. Moreover, all of these political forces do not oppose, or actually endorse, the wars engendered by the capitalist West’s economic crisis, be it against Libya, Syria, Ukraine or the DPRK. We need all hands on deck to win basic rights for refugees, so of course no one should be “kicked out” of actions in defence of refugee rights. At the same time, there does need to be a political split with the current leadership of the refugee rights movement, as their politics can ultimately only prevent, not enable, victory. The politics that can win is one which seeks primarily to mobilise a united front of the working class, which can then draw in students, artists, musicians, churches and even some community groups in behind. It is only the collective workers who have the power to end abuse of refugees due to their strategic class position, which drives the accumulation of wealth. Politicians, NGOs and similar elements cannot do this, as they are tied politically to the profit system. The key obstacle to mobilising the working class is the conservative Union bureaucracy, tied also by a thousand threads to the system which provides them well-paid careers. From this materially privileged position, Union officials not only refuse to assist the refugee rights struggle, but tie their members and the workers generally into Canberra’s foreign policy – which is in turn tied into the US war machine. This war machine is currently threatening the world with nuclear war. It is not only in Syria and the DPRK where Wall Street seeks regime change – the ultimate targets are Russia and China. Working people cannot allow this catastrophic course to go unchallenged. It is the decaying capitalist system which delivers permanent war, horrific abuse of refugees, poverty, unemployment, ecological collapse, and much more. These crises nonetheless present an opportunity for workers’ party to point the way forward to an internationally planned economy, where the prosperity of society will leave no one behind, where all will work in common and have sufficient time to develop whichever skills they possess. The Workers League holds these aims and more – join us! For a 30 Hour Week With No Loss in Pay! The federal government strengthening the Australian Building and Construction Commission (ABCC), which is specifically designed to slash wages, conditions and safety for workers in the construction industry. The forced reduction of Sunday penalty rates for retail & hospitality workers. Working people are enduring all of these attacks on their working, and thus living, conditions, and much more. Bullying and harassment by managers and supervisors is rife, and workers are doing millions of hours of unpaid overtime. Understaffing is widespread, resulting in unbearable workloads for the staff remaining, especially in the public sector. Nurses and teachers are stretched to the limit, and there is gross underpayment of staff in areas such as childcare. Wage growth in Australia is currently standing at the lowest level in history. Unemployment is rife, with many young people and university and school leavers unable to find work. On top of all of this, the federal government is attempting to push the retirement age out to 70 years! Who is waging this war? There is indeed a large scale war on workers in Australia, and in large parts of the world internationally. In order to fight back, Union members and workers generally need to be aware of just who, or what, is waging this war against us. The fact is that it is not just the Turnbull government, and not just the Liberal National Party (LNP), which is putting in place anti-worker laws. The Australian Labor Party (ALP) has barely opposed ANY of the anti-worker laws being enforced. Nor has any parliamentary party taken a consistent position of defence of working people. Of course, the attacks on workers are not just emanating from the federal and/or state parliaments. They originate from the entire class of employers, large and small. This is because the capitalist profit system is in dire crisis, and the only way out – for them – is to make workers pay for it. This is the source of who, or what, is waging this war against workers, and driving anti-worker measures such as relentless privatisation. The Union leaders who have organised today’s rallies around the country are correct to raise the slogan “Enough is Enough”. However, the politics of these leaders is far from adequate, and can even lead to more attacks on workers. By targeting only the Turnbull government, the implication is that the election of an ALP federal or state government is the one thing that can stop the attacks on workers. But this is demonstrably false. Little can be won for workers without an organised struggle of working people and their Unions against the class of employers as a whole. This means that Union leaders need to facilitate, at the least, ongoing meetings of members and delegates, so that Union members can decide on what is to be done, and what political strategy should be used. We would suggest that given the scale of the attacks on working people, a national industrial campaign needs to be waged, involving all types of mass action, up to and including nation-wide strikes. For a shorter working week with no loss in pay! The attacks on workers are so numerous, and so extensive, that it is almost exhausting to list them all, let alone campaign against them. One demand which can galvanise Unions and their supporters, nationally and internationally, is the demand for a shorter working week with no loss in pay. A universal demand for a 30 hour week with no loss in pay, if put forward by the entire Union movement, and backed by a concerted campaign of ongoing mass actions, including industrial stoppages, has the potential to unify and strengthen a Union movement and a working class which is in dire need of a fightback. Workers can explain how a 30 hour work week, with no loss in pay, would lead to a vast undercutting of unemployment. It would lead to an increase in disposable income in the hands of workers, enabling them to contribute to the wider economy in dire need of a stimulus. Workers could explain that the extra money required would need to be forced from the profits of the bloated corporations and government coffers – so both of these bodies would give back to the communities from which they extract labour. Under the banner of a shorter working week with no loss in pay, the increased confidence and combativeness that Unionists and workers will gain will most likely lead to increased ability to organise to defeat other attacks such as the ABCC, the removal of penalty rates, and rampant wage theft. Workers cannot expect the current crop of Union leaders to wage this desperately needed struggle. Invariably, today’s Union leaders are so comfortably ensconced in the system that refusing to fight is their second nature. There must be a new, class struggle leadership of the Unions which must push aside officials feathering their own nest. This task is bound up with the trial of forging a workers party which fights for a workers government. FOR A 30 HOUR WEEK WITH NO LOSS IN PAY! Ban the Bomb! No to Nuclear War! 17-06-2017 – “There’s a bomb hangin’ over our heads”….this familiar refrain from the era of Mutually Assured Destruction (MAD) is unfortunately even more relevant today. However, today there is no Soviet Union to offset the capricious destructive power of the US Empire. This does not mean the US behemoth encounters no opposition to its plans for global plunder. In Syria, Russia – at the invitation of the Syrian government – has effectively blocked US led efforts at regime change. 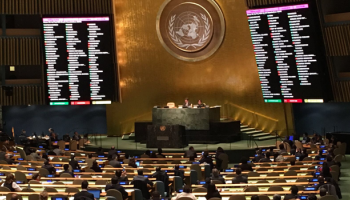 Iran and Hezbollah have given assistance, and the People’s Republic of China (PRC) at least voted against moves for regime change at the United Nations (UN). The US led campaign for regime change had active support from Britain, France, Saudi Arabia, Israel, Australia and others. The fact that this regime change operation was blocked, at least for now, has not stymied the US rulers’ appetites for regime change, in Syria or elsewhere. Economically, the global capitalist system is in terminal decline, and this drives ever more reckless wars of regime change, invasions, bombings, funding and arming of death squads to bring down sovereign governments, and much more. The USA, the leader of capitalist-imperialism, thus has its hands drenched in blood from current or completed or attempted regime change operations in Libya, Yemen, Syria, Ukraine, Venezuela, the Democratic People’s Republic of Korea (DPRK – also referred to as “North Korea”), and many others. US troops are stationed in over 130 countries around the world. Canberra, heading up the vassal Australian state, politically or practically backs, or participates in, all such operations. Today’s day of action has been organised to call on the Australian government to sign up to a global ban on the production and use of nuclear weapons. The governments of 130 nations have signed up to endorse this agreement. Working people should certainly not oppose such an agreement, were it possible to sign and have it enforced. The objectors at this stage include the governments of the US, Australia, Russia and China. Despite constant demonization by Western governments and their media, the DPRK was an enthusiastic signee. This fact demonstrates that despite the corporate media depiction of the DPRK as a mad “rogue state”, in actuality it would prefer not to have to spend resources in the development of nuclear weapons. The only reason it does, is that it is threatened with annihilation, nuclear or otherwise, at any moment, by US imperialism and its allies. Consequently, as Mike Whitney wrote: “There’s no country in the world that needs nuclear weapons more than North Korea”. This is why there is no contradiction between the DPRK signing up to a proposed ban on nuclear weapons, and the DPRK actually developing nuclear weapons themselves. It is purely a matter of survival. The ferocity of the US Empire’s war on Korea in 1953 left an indelible mark on the whole construction of the DPRK itself. The DPRK is more aware than anyone else of the unfathomable barbarism visited upon them during that war. Around 4 million Koreans and Chinese volunteers were slaughtered, bridges and power stations were reduced to rubble, relentless volumes of napalm were dropped on civilian targets, and that was just for starters. It is estimated that Pyongyang was reduced to a population of 50 000 during the war, whereas before the war it was 500 000. To DPRK citizens, these horrific memories are as clear to them as yesterday. Despite this, the DPRK has repeatedly stated, time and time again, that it is ready to “conclude an agreement to end its nuclear programs, put them all under IAEA inspection and conclude a permanent peace treaty to replace the ‘temporary’ cease-fire of 1953.” The DPRK has consistently stated that it will end its nuclear weapons program if US forces are withdrawn from the southern half of the Korean peninsula, and if the annual “military exercises” conducted on the doorstep of the DPRK, where the US military and its allies practice for a regime change invasion, cease. This entirely reasonable offer has been stated time and time again, only to be ignored by the US state. US designs for regime change in the DPRK are also aimed at the neighbouring People’s Republic of China (PRC), perhaps even more so. It was largely to contain the 1949 socialist revolution in China that the US launched the war against Korea in 1950-53. Today, China’s dominant socialist economy is leaving the capitalist economies for dead, outstripping it in ongoing GDP growth, driving spectacular investment in infrastructure development, and even offering other countries the opportunity to take part, with its One Belt One Road program. The US, with a declining economy and crumbling infrastructure, is well on the way to being overtaken as world number 1. The US ruling class knows that it must take action against Red China sooner rather than later to prevent this from happening. Hence we have the irrational threats against the DPRK, and relentless provocations by the US in the South China Sea. The installation of Terminal High Altitude Area Defence (THAAD) missiles in South Korea are also patently aimed at China, given that they will be virtually ineffective against a conventional missile strike from the DPRK. These very real threats are the precise reason why the PRC itself needs its own nuclear arsenal. The threats of the US Empire towards Russia are no less serious. Russia, as well as China, is being encircled by a swathe of US military bases. The relentless expansion of NATO, along with military hardware and missiles being installed right up to Russia’s border in Eastern Europe, means that Russia, regardless of its wishes, must also maintain and develop its nuclear weapons stockpile. To not do so would result in extermination. For example, the forces of NATO members Canada, the United Kingdom (UK), France and Denmark, which have recently been deployed, are part of an “Enhanced Forward Presence” in the Baltic states, as well as Poland. In excess of 4000 NATO troops are building what are in effect permanent bases in these countries, menacingly pointed towards Russia. At best, these developments violate an express agreement signed in 1997, that NATO would not seek to establish permanent bases in the nations closer to Russia. At worst, it greatly heightens the danger of an accident which could trigger a military, or nuclear, confrontation. From where do the threats of war arise? While working people should not oppose universal bans on nuclear weapons, i.e. a commitment by ALL countries, imperialist or otherwise, not to produce or stockpile nuclear weapons, we should be clear that the threat of nuclear war does not arise because some states are armed with nuclear weapons. The threat of war, nuclear or not, is present due to the day to day operation of the system of capitalist-imperialism. Leading this system is the ruling class of the United States, which is currently threatening nuclear world war via its simultaneous regime change threats against Syria and the DPRK. Any more US moves to take down the Syrian government, could activate Russia, which is doing its utmost to defend Syria and prevent such a potential nuclear war. At the same time, any more US moves to strike the DPRK, would of necessity bring in the PRC in self-defence, but also could lead to nuclear war. This is why, despite laudable efforts to ban nuclear weapons, while US imperialism exists, anti-imperialist, socialist and independent states (e.g. China, Russia, Iran, DPRK) will need nuclear weapons to defend themselves. In fact, despite the demonization by the Western corporate media of the DPRK, the very existence of the DPRK’s weapons stockpile is actually part of what is currently preventing a nuclear war. Many attendees at today’s rallies are ironically enjoying a peace which the nuclear weapons stockpile of the DPRK (and China and Russia) ensures. It is only the nuclear deterrent existing in these states which currently prevents them, and large parts of the world, from being obliterated by the US juggernaut – inevitably with the backing of Canberra. This situation of a delicate balance, where the nuclear weapons potential of the socialist or independent states is used as a defence against the nuclear weapons potential of US imperialism, unfortunately can’t last forever. Capital, the mainstay of the “free enterprise” system of the West, has to expand or die. It has to accumulate not only profit, but an adequate rate of profit. Once the opportunity for capital expansion has expired within the home country, it must seek others in other parts of the globe. If other countries do not allow foreign capital plunder, sooner or later the drums of war begin to beat, talk of “humanitarian intervention”, “democracy” and “human rights” grows louder and louder. The US and the NATO monster are switched on, and voila! Regime change is here again. This is one reason why war itself will not be removed until the planet is able to rid itself of capitalism. As it was during the First World War, the struggle to stop world war is also a struggle for the overthrow of governments prosecuting wars. This requires a politically aware working class, and a workers’ party prepared to lead this struggle. We can begin to assemble such a party now, even if the subjective conditions for it do not currently exist. Right now, it is important that working people raise and organise around such demands as Hands Off the DPRK, China, Syria, Russia and Iran – putting the political heat squarely on those who currently threaten to unleash World War III – the governments of the US, the UK, France, Saudi Arabia and their allies, including Australia. To do this, working people will need to apply pressure to their own Union leaders – many of whom are thoroughly tied into the system which provides them well-paid careers, and thus are tied into Australian government foreign policy. These positions flow from Australia being an imperialist power in its own right, albeit a minor one. The Australian people are overwhelmingly against a world war. This does not mean, however, that a “broad” peace movement is all that is needed to somehow prevail. In fact, rather than uniting the peace movement, such as it is, what is required is for pro-worker elements to break away from those who wish to direct appeals to the very rulers who are enabling the conditions for world war. That is, the anti-imperialist elements need to break away from the pro-imperialist sections. For no matter how many words political forces such as the Australian Labor Party (ALP), the Greens and NGOs may offer against war, the fact is that they are a strong pillar of the capitalist system producing it. Many of the members of these organisations would strongly campaign against imperialist war, and such folk should be welcomed. A problem arises when representatives of the liberal side of the ruling class are openly asked by peace campaigners to be “stars”, or special guests. Doing so cripples the politics to such an extent that it the movement becomes one which is appealing to the very purveyors of war itself – the Western ruling classes. Imagine in feudal times appealing to the King’s forces to stop waging war against the next fiefdom, which were conscripting peasants by force to do so. Every rank and file worker today would understand that that appealing to the King would be fruitless, and that the only hope would lie in a generalised peasant revolt. Today we no longer live in such times, and we have the advantage that the modern ruling classes, the bourgeoisie, often prefer to rule by manufactured consent rather than by force. Breaking this manufactured consent cannot be done, however, while political forces hostile to independent working class action are allowed to dominate the “peace” movement – whether they be ALP or other politicians, NGOs, or conservative Union leaders. The danger of world war is real, and it emanates from the very system which “our” politicians preside over. These politicians are not “ours” in the slightest. The working class must produce its own leaders, and its own party, if we are to stand a realistic chance of preventing war through ending the rule of capital, and establishing workers rule. NO TO WORLD WAR! “North Korea’s consistent message to the U.S.”, President Jimmy Carter, Washington Post. 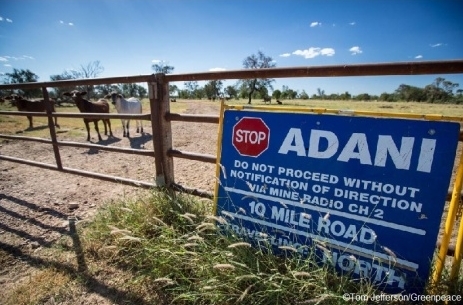 Stop the Adani Death Mine! Mobilise Mass Opposition! 02-06-2017 – Abomination. There is barely another word to describe the proposed mega-coal Carmichael mine proposed to be built by the Adani Corporation in Queensland’s Galilee Basin. If built and operated for the proposed 60 years, it may well contribute to the end of world efforts to limit global average temperature rises to less than 2 degrees Celsius. The carbon contained in the Galilee Basin’s coal reserves alone – 250 000 square kilometres of thermal coal – contain roughly the same amount of carbon contained in all of ExxonMobil’s holdings, the world’s largest company. The development of the Adani “mine of death” would mean six open cut pits and numerous underground mines. The coal would be transported 200 kilometres to a terminal at Abbot Point, right next to the Great Barrier Reef. Australia’s carbon emissions would more than double. There is a high probability that the Adani mine will definitively finish off the Great Barrier Reef. To this point already, reef specialist Professor Terry Hughes revealed that coral bleaching – the literal dying off of the coral itself – now covered 93% of the Reef. As the intensification of global warming warms the oceans, the sea itself becomes more acidic, killing off or threatening to kill off whole ecosystems – from coral to fish to large predators, i.e., whole food chains. One of the natural wonders of the world, the strangulation of the reef should be yet another urgent bell-weather of the desperate situation climactic collapse ensures. As Jeff Sparrow writes, however, any sense that an occurrence so grotesque as the annihilation of a natural wonder would somehow spur politicians to finally do something, should now be put to rest. The politicians that currently exist here will scarcely do anything to even seriously limit environmental desecration. In fact, politicians here are doing everything they can to enable this hellish future. Take the Queensland Labor Party government. It has fallen over itself to get the diabolical Adani coal mine up and running, irrespective of the climate science, not to speak of its own members. First it offered a 320 million dollar “royalties holiday” to Adani, making a mockery of the entire concept of royalties. After some outrage, the Labor Party and Adani later came to an agreement, the details of which are not fully known, but it is suspected that a flat 5 million dollars will be paid. For a 21 billion dollar mine, this is of course risible. In addition, in a move which flabbergasted even seasoned environmental activists, the Labor Party approved a measure which allows Adani to only monitor and report on the amount of water it extracts from the Great Artesian Basin, from now until the permit expires in 2077! Needless to say, this could have massive impacts on the water available for agriculture and other purposes. It is estimated that this would mean Adani would extract 9.5 billion litres of water for each year the mine was operational. And on the driest continent on earth, Adani would not have to pay one cent for this water! Some die-hard Labor party members state that despite the (virtually criminal) actions of the Queensland Labor party, “federal” Labor has opposed the mine. In fact, federal Labor under Bill Shorten worked with the Liberal Party to ensure that Native Title for the Aboriginal people would not even be considered when assessing approval for Adani’s mine building. This bill has been delayed in parliament, and the Wangan and Jagalingou Family Council, representatives of the traditional owners, remains steadfast in its opposition to the construction of the mine. Add to this Liberal Prime Minister Malcolm Turnbull’s visit to New Delhi to Adani executives and his offer of a 1 billion dollar unconditional loan from Australian taxpayers to pay for the rail line needed to transport the coal. As if this wasn’t enough, it is mooted that these funds will be allocated from the Northern Australia Infrastructure Facility! The level of direct and indirect corruption is staggering, but such corruption is business as usual for the capitalist system. In fact, the amount of corruption just for this project is just a slim percentage of the overall racket of virtually tax-free mining in Australia. Australia’s giant Pacific neighbour, the People’s Republic of China (PRC) is trending in the opposite direction with regard to coal fired energy use. It should be noted that for a country which is still in many parts developing its economy, despite its huge advances, it is more difficult to do without coal as an energy source. Nevertheless, Red China is arguably leading the world push towards switching from carbon intensive energy sources to carbon free ones. Just this year, Beijing closed its last large coal-fired power station. Moreover, as part of the drive towards using zero carbon energy sources, the PRC will close around half of its operating coal mines. Some renewable energy advocates point to China in leading the way in the production of solar panels and wind turbines. But for serious capacity in terms of zero carbon energy, the PRC is building nuclear reactors. 46% of the new reactors currently being constructed are in mainland China. There is one reason why the PRC leads the world in both economic growth and in the drive towards sourcing energy from zero carbon sources. The Chinese economy, primarily, does not operate on the basis of production for profit. The socialist state led development they are capable of has only come about since the working people were able to overthrow feudal and foreign capitalist plunder, which triumphed in 1949. In the PRC today, it is clear that the overwhelming majority of the “commanding heights” of the economy remain state owned or majority state owned. They are often owned and controlled by gigantic state owned enterprises (SOEs) which simply do not have to turn a profit, and often run at profit rates below 1%, which would not be possible under the “capitalism” of which some critics accuse it. Decisions can be made in the interests of the environment and workers’ rights in the PRC, whereas in the capitalist West such motives barely rate a mention. Socialism versus capitalism as a pathway to address climate meltdown, however, is the furthest away from the agenda of the three main bodies which are combining to stifle mass action to stop the Adani leviathan. Peak environmental “NGOs”, the Australian Greens, and some Union leaders, who remain loyal to the Labor Party and/or the capitalist system, represent the obstacle to the action which has the possibility of preventing the erection of climate destroying mega-coal mines. NGOs such as GetUp!, the Australian Youth Climate Coalition (AYCC), and 350 Australia are active online in opposing the Adani mega-coal mine. However, these peak bodies are all about controlling the campaign against Adani, and controlling it to align with their politics – which ultimately means lobbying the very corporations and governments enabling it. For example, 350.org were the main organisers of large scale public meetings about the Adani mega-mine, but they were only “public” for those who could afford the $15 dollar entry fee! The Australian Greens, despite their commendable words against the Adani inferno, are almost solely campaigning in electoral terms. After winning a Brisbane City Council seat in the Woolloongabba ward for the first time, the Greens are attempting to capitalise on the sentiment against Adani to win the state seat of South Brisbane from the Labor Party’s Deputy Premier Jackie Trad. To be clear, if the Australian Greens win parliamentary seats as a result of a principled position against climate destroying developments, then working people should not begrudge them. But it is something else entirely to subordinate the politics of such a movement to electoral machinations of any party, even one which is, at least verbally, taking a side against the encroachments of capital. Union leaders should be leading a campaign for jobs through raising and fighting for demands such as a shorter working week with no loss in pay, rather than building a cosy alliance with exploitative corporations themselves. Then they would be free to help lead mass based campaigns, which could gather backing from working people, and could be joined by others justly concerned about the potentially catastrophic future vastly increased carbon emissions will mean for those who come after us. They could also sideline wealthy corporate NGOs and prevent them from shepherding all opposition into harmless lobbying exercises. Political parties such as the Greens would be welcome to take part, but not in terms of reducing the entire campaign to an electoral front. There is huge potential for such a campaign, as there is overwhelming sentiment amongst the majority of working people that this disaster of a mine should not go ahead, and there definitely should not be billions of dollars of taxpayers funds handed over to a dubious corporation to build it. Yet the potential for the desperately needed campaign of mass mobilisation is crippled by the political outlook of the mines’ opponents. Well-funded NGOs, parties such as the Greens, and conservative Union leaders do not have a perspective which can see outside the parameters of the system of private production for private profit. This is not a matter of expecting such forces to consent to a workers’ revolution. But long before the conditions for the revolutionary overthrow of capitalism come into being, the methods of class-based struggle are the only ones which can win a serious battle such as this one. The Adani mega-mine is symptomatic of the normal workings of capitalist exploitation of the natural world. It is for this reason that the political forces which complain about the excess of this system without opposing the system itself, e.g. GetUp!, 350.org, AYCC, must be challenged by working people for leadership of this campaign. Working people also need to position their silent or complicit Union leaders, which should at least be helping to facilitate a movement of class-based mass opposition, centred on mass mobilisations. Working and oppressed people desperately need a victory. Here is one campaign, which, given correct leadership, has a huge chance of succeeding. At the same time, working people should be aware that even if the Adani monstrosity is stopped, runaway climate collapse is still on the cards. To begin to deal with this emergency, let alone the other dire emergencies such as economic stagnation, joblessness, homelessness, and the threat of war, the capitalist system will have to be overthrown and replaced with socialism, run by working people. Key to this task is the forging of a genuine workers party, the assembling of the most class conscious working people into a politically leading force. There is nothing to lose, but a world to win.